View of “Nancy Shaver,” 2015. Nancy Shaver uses and reorganizes the material chaos of our visually saturated everyday. As an assemblage artist, she weaves together found patterns and refashions them into eclectic juxtapositions of disorderly order. A typical Shaver form consists of a grid of boxy canvases, usually joined together two deep into a larger block, and covered with different patterned fabrics upon which are also collaged clothes and pieces of drawings. 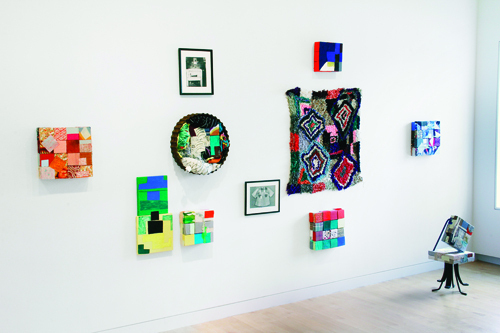 On display here is an early example, Cigar Boxes, 1990, consisting of various earthy brown and yellow fabrics over a stack of rectangular blocks on a grid of cubes, as well as a later iteration from 2015: Blue Chair as Base, in which a Matisse-esque series of cerulean-blue forms dance over a blue-and-green matrix of blocks. This entire piece snuggles against a low aquamarine chair—Shaver’s witty version of a plinth. Invited to expand the context of her practice with historical material, Shaver picked the photographs of her friend Walker Evans along with some of Sonia Delaunay’s pieces to display. This juncture of repeating designs and quotidian scenes is the wellspring of Shaver’s bricolage. Things from the world gently work their way into her sculpture but also sit alone, deprived of function, exuding their own worldly presence. One of these is a Moroccan rag rug from circa the 1960s. The exhibition’s centerpiece, a triptych, is A Hybrid (a decorative ensemble), 2014, which includes a large round brass mirror adorned with a relief of the zodiac and flanked by Shaver’s trademark block matrices, making clear the worldly inspiration of her art.